In their promo notes, Connecticut's Scapeland wish is compared to bands like Yes, Rush, and ELP. I'm not sure I quite hear that comparison, maybe a little early Rush in there, from their more melodic and acoustic moments. 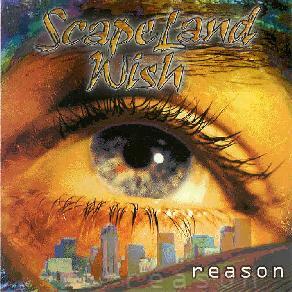 But mix that in with some Kansas, adult contemporary rock, a few classical flourishes, vocals reminiscent of Steve Perry of Journey, and you may have a sense of Scapeland Wish's highly melodic brand of progressive rock. Generally, this kind of music isn't my thing, but I found myself drawn in by the easy melodies, great harmonies, and most of all, the competent, stylistic instrumental chops of the players. They sound equally comfortable playing soft acoustic music, jazzy workouts, and heavier, more dramatic and symphonic rock. The tracks range in length from brief, experimental bits to longer, but not quite epic tracks in the 6-7 minute range. The opening instrumental Prelude to Reason, and the following track, Utopia are both lushly orchestral. But the band also rocks out (albeit lightly) on tracks like The Absence of God, the edgy A Brave New World, and the slightly funky Chinese Spare Ribs (all with excellent bass-work from Stiskal). They also delve into evocative, pastoral acoustic instrumentals like Snow in Santa Fe, and the exquisite Silver Sleep. Overall though, this is a band trying to find its own distinct sound, but one that hasn't quite managed to yet. But the promise is more than there in this collection of quality songs. Reason is an album worth picking up, and Scapeland Wish is a band worth watching, for what they will produce in the future. For more information you can visit the Scapeland Wish web site at: http://www.scapelandwish.com. Contact via snail mail c/o Scapeland Wish; 36 Hanover St; Stamford, CT 06902.